Look Floors Standard Terms & Conditions apply. 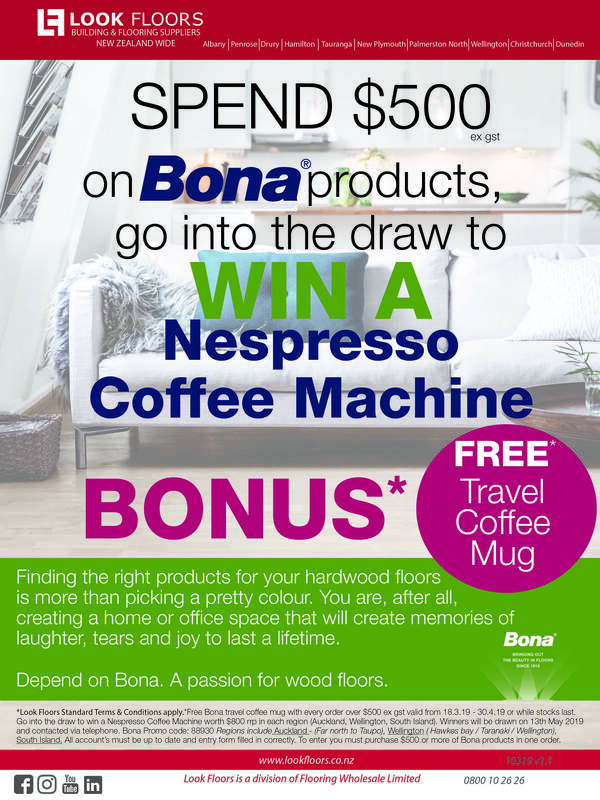 *Free Bona travel coffee mug with every order over $500 ex gst valid from 18.3.19 - 30.4.19 or while stocks last. Go into the draw to win a Nespresso Coffee Machine worth $800 rrp in each region (Auckland, Wellington, South Island). Draw will be drawn on 13th May 2019, winners will be contacted via telephone. Bona Promo code 88930 Regions include Auckland - (Far north to Taupo), Wellington ( Hawkes bay / Taranaki / Wellington), South Island. All account’s must be up to date and entry form filled in correctly. To enter you must purchase $500 or over of Bona products only and in one order.